Marketing company for electronic desktop and hand-held calculators. Most calculators were made in Asia. 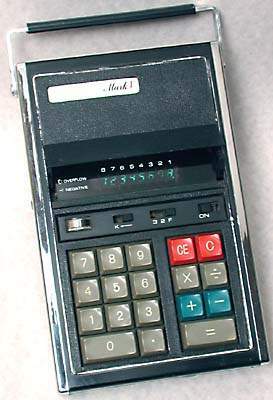 This is a typical chunky, early, hand-held electronic calculator with LED display and rechargeable cells, dating from about 1972/3. This is a large hand-held calculator from about 1972/3. It has a cover over the display which flip-ups when the calculator is switched on, and a battery-level meter. It requires four C-cells. This was also made in Japan. 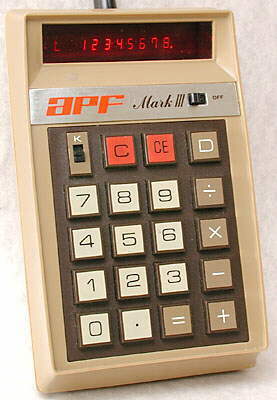 For further photographs of apf calculators see the Calculator Photo Library on this site.